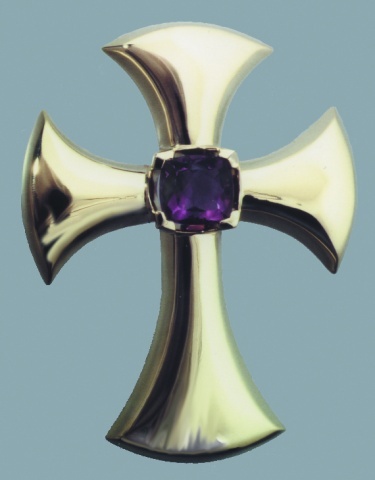 A pectoral cross created by Nancy Denmark for the September 9, 1995 consecration of The Rt. Rev. Leopoldo Alard, a suffragan bishop of The Episcopal Diocese of Texas. This is where it all began as this was my first commission to make a bishop's pectoral cross. Many people ask how I got to design and make all these bishop's pectoral crosses and I love to tell the story of this special man who started it all. I remind people that everyone starts out as "ordinary folk" no matter what high place one may end up in. I first got to know this man as a priest and fellow exhibitor at many a church conference. He worked for the Hispanic Ministries of The Diocese of Texas and often had an informational booth at church events to share the ministry. I have been exhibiting my Christian symbol jewelry at church events since the late 80's. When exhibiting at these church conferences we are never the main event so when the attendees are in meetings, exhibitors have lots of time to get to know each other. I used to travel with a large showcase full of gold rings with colored gemstones and Leo Alard loved jewelry. He would spend time at my booth during these "in between" times admiring and trying on my rings. I used to have a large gold ring with an amethyst that he especially admired and he would tease saying that when he became a bishop he would get that ring. So years later when he was elected to serve as Bishop Suffragan for the Diocese of Texas, he called me explaining that while he really was kidding all those years, he would like for me to make his pectoral cross. And that's how it all began...with ordinary folks passing the time in ordinary conversations....although Leo Alard was always an extraordinary person before his consecration and following. Bishop Alard died in 2003 and is greatly missed by so many.